This impossibility of satisfying those who feel they never have enough certainly helps to explain why security is a proverbial black hole—and a highly lucrative one in terms of the political, financial, and material resources it affords its champions. 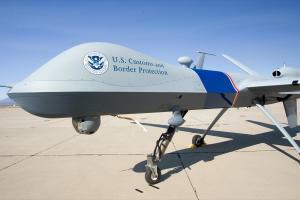 One of its more recent expressions in the U.S.-Mexico borderlands is what is technically known as an “unmanned aerial vehicle,” or popularly as a drone. Six of them—Predators, just like the deadly ones the Pentagon deploys in Afghanistan, but minus the missiles—now prowl the region. Their presence exemplifies the slippery slope and blurry divide between “home” and abroad in terms of the war-related technologies and practices employed in the name of security of various sorts. Embraced and advocated by members of Congress—a number of whom receive direct benefits from the military manufacturers who sell them—such technologies are growing in number and variety in the borderlands. Among the latest innovations are micro aerial vehicles—or MAVs. They are “tiny toys”—as one television newscaster recently characterized them—that individual Border Patrol agents could launch from their hands. These mini drones could, the host gushed, “help law officers catch terrorists and drug smugglers and other intruders.” With their hoped-for ability to fly through open windows and to navigate rooms of a building, they could also provide authorities with unparalleled levels of surveillance capacity. 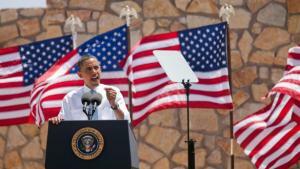 The MAVs are Barack Obama, El Paso, Texas, May 10, 2011. just one of the many manifestations of the never-be-satisfied approach to matters of immigration and security to which Obama referred in El Paso. He made the characterization in part to score some partisan political points—he singled out his critics in the Republican Party. Yet, as Obama’s record-setting border and immigration policing budget painfully illustrates, the embracing of ever-more enforcement resources—including border drones—is very much a bipartisan affair.